Producing solar energy relies on having working, efficient equipment, and there are a number of factors that can reduce your system’s effectiveness. Shade, dirt, damaged parts (such as wiring, inverters, or panels), and more can all cause your system to generate less electricity than it’s capable of. It’s important to carefully watch your solar panel production so that you can identify issues when your system isn’t performing as it should. Your solar inverters provide information about system performance. Independent solar monitoring services take information from your solar inverters about the energy production of your system and interpret that data to make sure your solar project is operating at its best. Independent monitoring companies are primarily data aggregation and management experts. They employ sophisticated software that ingests data from solar arrays and runs that data through calculations to ensure the connected panels are performing as expected. Monitoring services can be “hardware agnostic,” meaning the software works with any kind of panels or inverters. A common misconception about independent monitoring services is that you can get the information they provide yourself, right from your solar system. This is only partly true. While companies like Enphase and SolarEdge make inverters with built-in monitoring capabilities, they don’t necessarily provide the information you might need. Monitoring your solar system through solar inverters does provide data on your system production, but can’t always diagnose a problem for you. For example, you may be able to see raw numbers showing decreased production from a certain panel, but unless you are an experienced solar technician, it will be difficult to understand what is physically wrong with that panel without outside assistance. 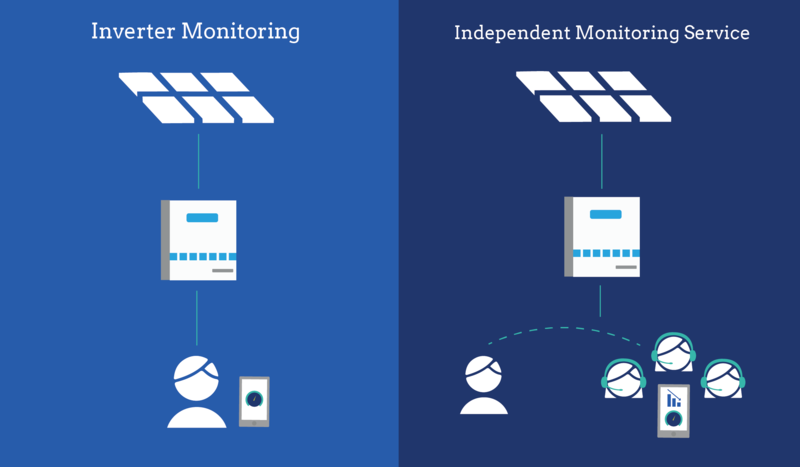 This is where independent monitoring comes in: monitoring services companies such as Locus Energy take the data your inverters collect from your panel setup and interpret it for you. This helps you understand when something is wrong, what is not working correctly, and what measures need to be taken to have your system running properly. Independent monitoring services have the unique benefit of being able to actively monitor your system, meaning monitoring companies will interface with an operations and maintenance company to help proactively address issues that their technology identifies. Knowing what your solar array is doing is only one step of the monitoring process. Through active monitoring plans, you can make sure that problems with your panels are recognized and diagnosed quickly and correctly, in order to implement a plan of action to bring your equipment back up to speed. Importantly, an independent solar monitoring service does not necessarily involve a plan for physical repairs to your system if a problem is detected through data analytics. For repairs to your system, talk to your installer or consider a solar operations and maintenance plan. Additionally, check out our solar monitoring system overview for more information about built-in inverter monitoring.